One of my favorite colloquialisms is schmoozer, derived from the Yiddish shmuesn, meaning “To converse casually, especially in order to gain an advantage or make a social connection.” The schmoozer says what he has to say to gain the advantage he seeks. What he really believes is a different matter. Faced with the worldwide scandal his utterance of this heresy had provoked, Francis, as I recount here, told Bishop Athanasius Schneider privately that he could say “that the diversity of religions is the permissive will of God,” whereas Francis would make no effort publicly to correct his own statement contrary to the Faith. And, at any rate, the “permissive” will of God is a mere toleration of evil. One would not say, therefore, that God “wills” mass murder or, for that matter, the sins of all men. Nor does God in any sense will the existence of lying religions, as the Joint Declaration claims. The good bishop was schmoozed by a consummate schmoozer, who told him what he wanted to hear, but only when the bishop had backed him into a corner. I suspect, however, that Bishop Schneider knew full well he was being schmoozed but was exploiting this Pope’s capacity for schmoozing to extract, at least orally, some kind of correction. Nonetheless, schmoozing it was. Evidently, Francis didn’t believe a word he said to Bishop Schneider. For as LifeSiteNews reports, only days after Bishop Schneider’s March 1 meeting with the Pope (on or about March 18), “The Vatican’s office for promoting interreligious dialogue has asked Catholic university professors to give the ‘widest possible dissemination’” to the Joint Declaration, with no correction of its blatantly heretical claim that God wills the diversity of religions that contradict His revelation and even the most basic precepts of the natural law. 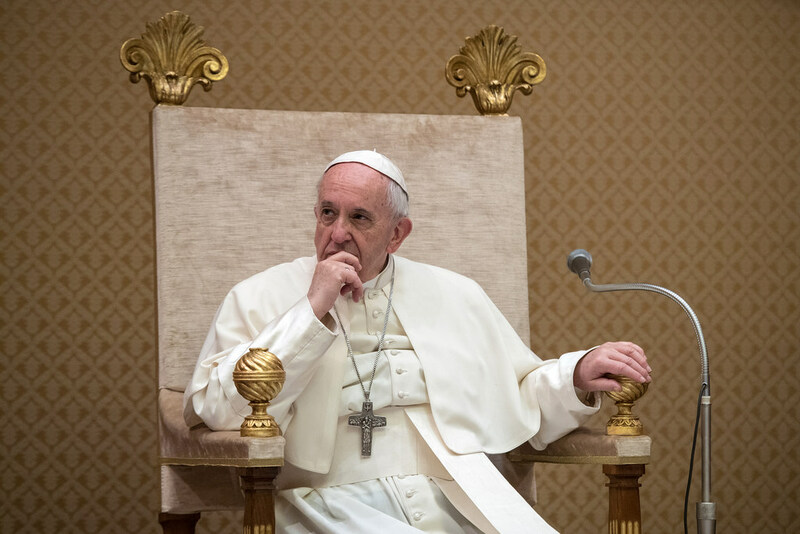 That is, not only has Pope Francis doubled down on his heretical statement, he has ordered that it be made part of a veritable educational program which would incorporate the idea that God wills — i.e., does not merely permit the evil of — the existence of innumerable false religions. “It is contrary to the Church’s way of speaking to use the phrase ‘faith in God’ to mean ‘affirming that God exists,’ or ‘believing in any kind of alleged revelation, even a non-Christian one… Faith, is the [supernatural] virtue through which God moves us to assent to what He has revealed through the Old Testament prophets and the New Testament apostles, and most of all through His Son. And human opinion is precisely what Francis has expressed in the Joint Declaration. An opinion to which he obviously continues to cling despite his schmoozing of Bishop Schneider. The bishop deserves nothing but praise for his effort to obtain a correction of Francis’ heresy from its author, but it was too much to expect that Francis would stick to what he said privately, much less declare it publicly. For a schmoozer converses “to gain an advantage,” not to affirm the truth. The advantage having been gained, Francis quickly moved on to continue promoting what he really thinks and what he really wants everyone to believe.